[PDF] Bipolar Disorder in Young People: A Psychological Intervention Manual | Free eBooks Download - EBOOKEE! 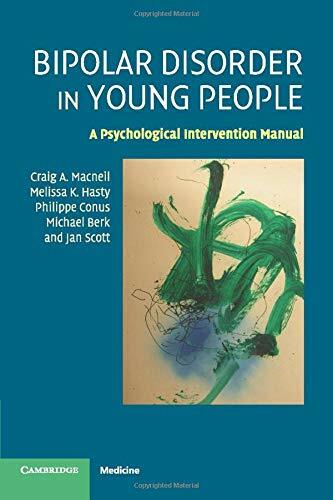 Description: As research emerges on the effectiveness of psychological therapies for bipolar disorder, this is the first manual guiding the treatment of those in adolescence and early adulthood, taking into account the developmental issues which can have significant impact on therapeutic outcomes. Core issues covered include engagement difficulties, how cognitive therapy should be adapted for adolescents, the impact of the disorder on the person's psychosocial development, managing comorbidity (particularly alcohol and substance use), medication adherence, the impact of family dynamics, and issues around control and independence in the therapeutic relationship. The manual is illustrated with case studies and text boxes describing tips and techniques for the therapist. Providing clear clinical guidance, backed by an extensive literature review and theoretical overview, this is essential reading for all mental health specialists implementing psychological interventions for young people with bipolar disorder. No comments for "[PDF] Bipolar Disorder in Young People: A Psychological Intervention Manual".